Looking for a super activity to entertain the kids at Easter? Why not combine cooking and chocolate, the go-to treat on this special holiday! 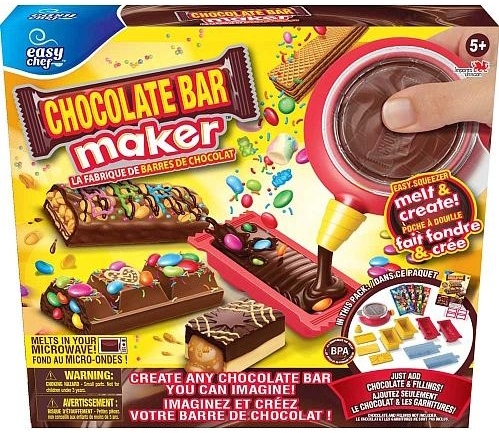 The Easy Chef Chocolate Bar Maker, an Australian product imported by a Boisbriand company, can be shopped here and there. I personally saw it at my Jean-Coutu drugstore, Toys’R’Us, Archambault, etc., for around $19.99. Essentially, it’s a chocolate making kit comprising multiple mini silicone molds with which kids can make small chocolate bars for their personal enjoyment or to offer as a gift. The kit includes 4 molds, 6 texture inserts, 1 decorative nozzle, plus 4 pretty gift sleeves with stickers to gift your chocolate masterpiece. You can even create chocolate bars with your choice of filling. Warning: This is a “cooking” kit only, so you need to buy your chocolate chips and decorations. 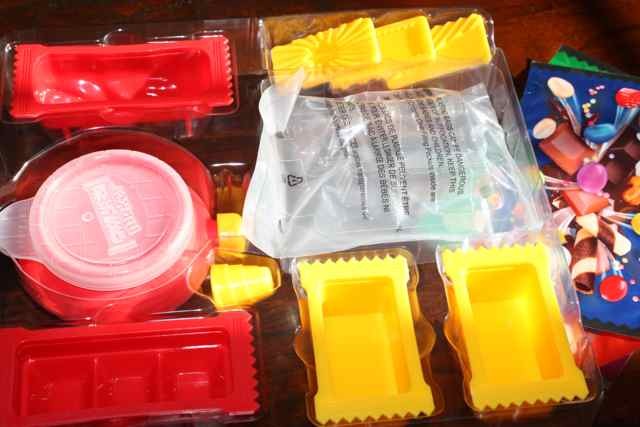 While you could probably purchase similar silicone molds for less at the nearest cookware store, it can’t replicate the thrill of opening your “kit” and discovering the multiple gizmos inside. It reminded me of my favourite toy as a child, my Easy Bake Oven, and all its prepackaged cake mixes, molds, etc. that were the apple of my eye. 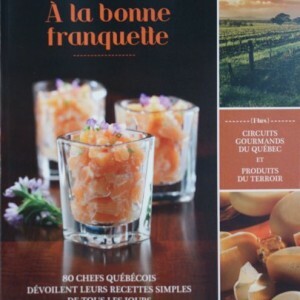 Not too surprising to learn I became a food writer, n’est-ce pas? You’ll want to prepare all your ingredients before you start: nuts, gummy bears, Smarties, caramel, chocolate syrup, etc. 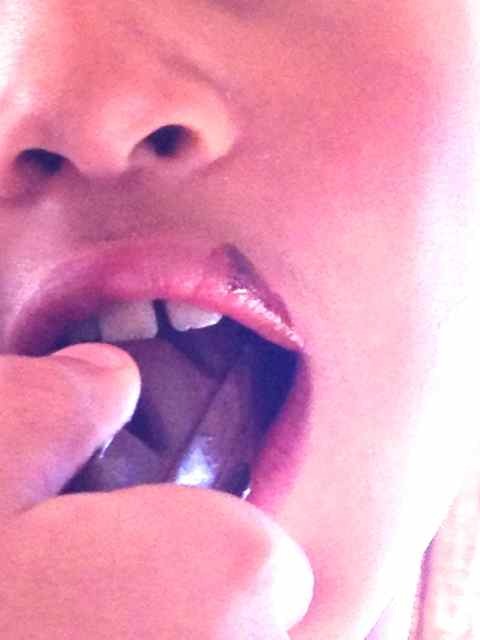 With a foodie mom in the kitchen, wouldn’t you know, we tested the kit with Valrhona Guanaja dark chocolate with 70% cocoa, and a filling made of natural peanut butter. A seriously torqued Reeser’s Cup in other words. It’s quite a bit of work just to make a couple of chocolate bars, but kiddo usually loses interest after 30 minutes, so it kept him busy the prerequisite amount of time. And me too, let’s face it. This is not an activity where you plump your kid down and walk away, you will need to supervise Junior, if only because chocolate melted in the microwave can burn with a touch (mind you, the silicone never became too hot to handle). 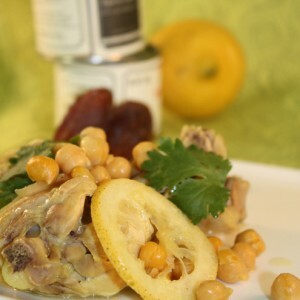 A less-impatient child could easily spend two hours making up multiple variations using different types of garnishes. Clockwise from top left: First you melt in the chocolate in the “Easy squeezer.” You pour it into the mold, insert a second mold to create a cavity if desired, then freeze. You pour in your filling, then cover with chocolate and freeze. 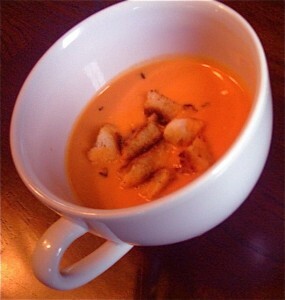 The finished product’s quite impressive, even without funky garnishes like here. So I’m a purist, sue me. The High: I was impressed that a company would go the extra step in developing silicone, and not cheap plastic, molds. This level of quality runs rare in kitchen gizmos aimed at kids, truth be told. 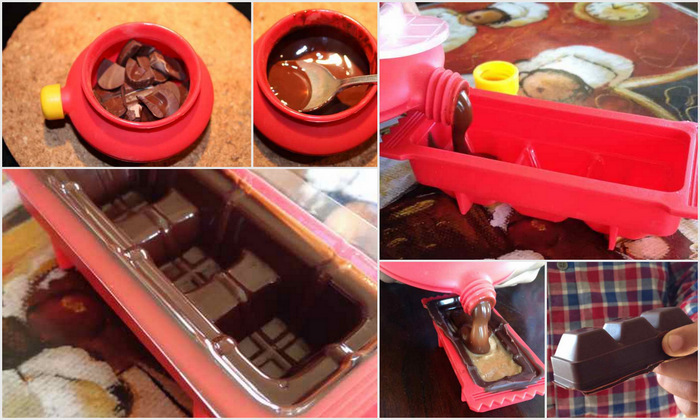 While you could essentially pour hot chocolate into the molds, with no need for an extra “easy squeezer,” it does ensure a level of safety, significantly so when you have kids that tend to be accident-prone. Ahem. So if your munchkin (5 or more) enjoys the experience, encourage him/her to dream up new and different garnishes… or in time suggest a visit to the nearest cookware store to stock up on even more chocolate making paraphernalia. It beats a commercial candy bar at the nearest corner store any time. Disclaimer: I requested and received this product for free to test and review. This post is not sponsored and all opinions expressed are my own.